The history of the idol of Shri Bade Hanumanji, situated at the Sangam Kshetra of Prayag is very unique. The internal story connected with the history of the idol is like this. In the city of Kannauj a very rich but issueless trader was living. He had a great storage of money and material and had all the enjoyments of life; But unfortunately that trader had no issue. the wishes and hankerings will be fulfilled. At the dawn of the day he decided to work on the lines of the previous night dream. Thus leaving that statue at Prayag Kshetra that rich trader left for his city Kannauj. As the time passed that rich trader got a son born to his wife by the kindness of Shri Bade Hanuman Ji and all his wishes were also fulfilled. After some time that huge statue of Shri Bade Hanuman Ji remained submerged in the waters and got stucked under the sands. After some time a pinancing Mahatma Ji cladded with Vyaghracharma arrived at Sangam Kshetra in the holy month of Magha to have a pious dip in Triveni. The name of that pinancing Mahatma cladded with Vyaghracharma was Balagiri. Fortunately on one day when that pinancing Mahatma was piercing his Trishul in the sand to form his Dhooine, he got some inkling of that huge Shri Vigrah. That pinancing Mahatma Balgiri started to remove soil and sand from that place. 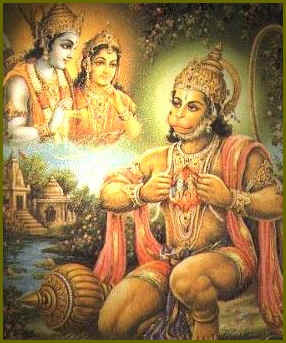 He got at that place the Shri Vighrah (statue) of Shri Bade Hanumanji. After purifying that Shri Vighrah that pinancing Mahatama had it situated at that very place and started to meditating upon Shri Bade Hanumanji. The nearby people were very much impressed by the sacred influence of that pinancing Mahatma Shri Balagiri and the fame of Shri Bade Hanuman Ji started to extend for and wide very rapidly. Another internal story about the Shri Vigrah of Shri bade Hanuman Ji is also prevalent. It is said that when the pinancing Mahatma Shri Balgiri Ji Maharaj got that statue of Shri Bade Hanuman Ji he made efforts to bring that statue in a standing posture but even after trying much hard, he was unable succeed. After it the statue of Shri Bade Hanuman Ji was tried to be laid in the fort. After many abortive efforts the devotees were unable to remove the same from that place. It is said that when the effort were made to bring the statue in standing position or to remove it to instal in the Fort the statue itself got stuck inside. Thus it was believed that Shri Bade Hanuman Ji did not want to be removed from that particular place then all the efforts to remove the same were stopped. Consequently the statue of Shri Bade Hanuman Jee was left at the place where it was Found by Shri Balgiri Ji Maharaj. Conceived, Developed & Hosted By : SHUCHITA TECHNOLOGIES (P) LTD.